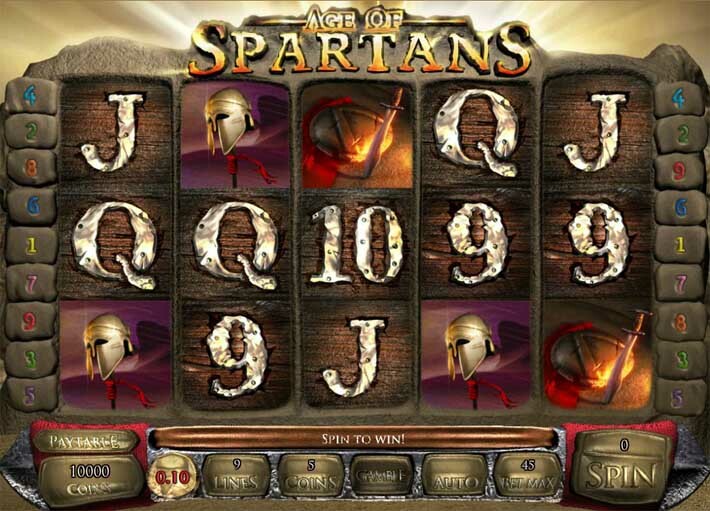 Age of Spartans is a historic themed online slot game by software developer Genii. It features some pretty high quality 3D graphics, as well as a color scheme that will make you feel like you’re watching the famous movie 300. The cinematic feel is further enhanced by the epic soundtrack. But as for the symbols, among others they also include the lower value playing card icons A, K, Q, J, 10 and 9. Other symbols include helmets, battle flags, horns, the face of a fierce warrior and shields. There’s also a fair maiden here as one of the character symbols. Not to mention that most of the symbols here also have some pretty cool and entertaining animated sequences. As far as the layout goes, we have the pretty common grid of 5 reels and 3 rows. There are, however, only 9 paylines in this slot game. And you will also have the opportunity to adjust their number if you so choose. The same also goes for the coins you would like to stake, which makes for a betting range starting at 9p per single spin. The maximum amount you will be able to wager, on the other hand, is £22.50 per spin. The RTP is dismal at only 90,60%. The King represents the Wild symbol in Age of Spartans. As such, he has the capacity to replace any of the other symbols on the reels to help create winning combos. Not only that, but for every winning combination the Wild takes part in, it will also double the payouts. Furthermore, the King symbol is also quite lucrative on its own, offering payouts of up to 10,000 times your line bet for 5 of a kind. The Wild can also appear in any position on the reels, but cannot, however, replace the Scatter symbol. The Scatter, in turn, is the symbol with the shield and the many arrows sticking out of it. It is also fairly lucrative and can allow you to pocket up to 500 times your total bet amount. But more importantly, it can trigger the freespins bonus feature, which is what you will be really after. In order to do so, you will be looking to land at least 3 Scatter symbols anywhere in sight during the same spin. This will award you a total of 15 freespins with a 3x multiplier on all freespin winnings! Furthermore, you will also have the opportunity to retrigger this feature and benefit from even more symbols. You will again need to land at least 3 or more Scatter symbols during a spin in order to do so. And in addition to all of the above, this slot also boasts its very own Gamble feature. With its help, you may potentially double your prize from any winning spin. 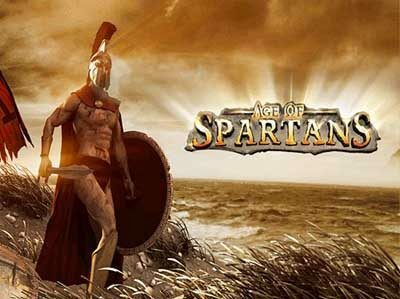 Age of Spartans is a thrilling and very rewarding slot, both visually and otherwise. But its very high volatility also makes this game quite risky, so be sure to keep that in mind.